RECALL ALERT: Certain containers of this flavor were recalled today, thank you for everyone that pointed it out. Specifics can be found here on Blue Bell's site. They are saying an outside firm delivered possibly contaminated cookie dough chunks. Please check your containers. [New for 2016, by CT of Nerd Lunch] Oh people, how you love your froyo and your over-indulgence of toppings mixed with multiple yogurt flavors. If I love Snickers pieces on ice cream and I love marshmallows on ice cream and I love butterscotch sauce on ice cream, why wouldn't I love all three together? I guess on some level that makes sense. Although that's not how it works for me. I'm a man of simple taste. When I hit the froyo place, I get one base flavor and maybe one complementary flavored topping. It's a different philosophy and neither approach is right or wrong. chocolate crème filled cookies and tasty chocolate chip cookie dough pieces"
I can't say for sure what inspired* Blue Bell's new flavor, but the idea of mixing cookies and cream with cookie dough bits immediately sounded like something the rest of my family would do at a froyo place. I like both cookies and cream and cookie dough, but never would I have thought to put them together, not even if they were both put in front of me. But Blue Bell did and decided to sell it in a package together. Honestly, it seems like a silly flavor to make and on paper, even buy. I mean, if you really wanted to, one could create this flavor themselves by buying one of each flavor and mixing it together in a bowl yourself. If you're short on freezer space, then you would only need to buy this one instead. I don't want to come across as negative though. I ate it... twice... and enjoyed it. 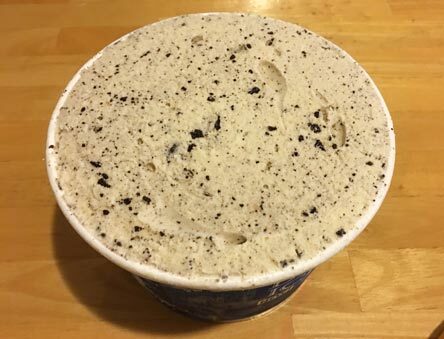 The Blue Bell cookies and cream is a favorite of mine. I love the big chunks of sandwich cookies that have softened up perfectly in the ice cream. 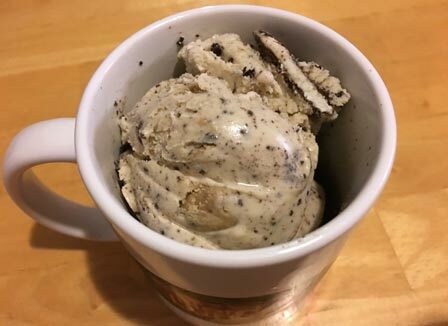 The cream of the cookies stands out from the ice cream and adds a nice texture. And the cookie dough pieces are soft and have the right level of chippiness to them. The description of the flavor indicates a brown sugar hint as a part of the base of the vanilla. If it was there, I didn't pick up on it. If you've never had Blue Bell before, this would be a great flavor to start with because you do get to try both. But unless you have the froyo philosophy that the rest of my family does, it may just make you wish you had gotten one or the other of the individual flavors instead. *Dubba's Note: I feel like another company tried this combo recently and it was also lackluster, but for whatever reason I can't remember who it was. The problem with a flavor like this is that it needs an X-Factor which maybe the brown sugar was supposed to bring but didn't. I have suggested to CT that he try B&J's Milk & Cookies to see what this combo can really do. I was also thinking about the milk n cookies from B and J. As I mentioned on that review, it's too much stuff for me, although the bite I saved for the end--basically a whole chocolate chip cookie--was pretty incredible. But except for the cookie vs. cookie dough, it sounds (and looks) very similar. 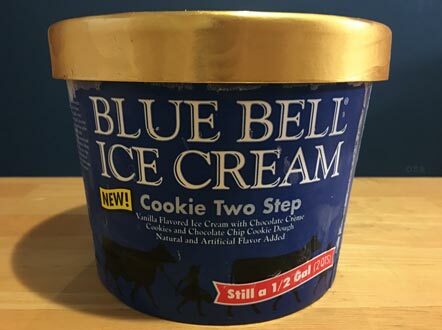 Blue Bell JUST issued a recall on this flavor, along with Cookie Dough. Due to possible listeria contamination. Again! Makes me very leery of the cleanliness of the facilities! I think either Marble Slab or Cold Stone has a creation that's pretty much the same. Anything with cookie dough is good by me. Hope you did not get listeria.. Stuff just got recalled. I think there's now a recall on this?! It's just like I was saying, it's a silly flavor. And by "silly" I mean "listeria." You might be thinking of Cookie dough S'wich up - the EU exclusive B&J flavor featuring cookie dough and "oreos"
@Jeppe: nope, I meant milk and cookies. like i said, it's not a straight up cookies & cream flavor, but I feel that the cookie swirl brings that C&C factor to cookie dough and it's wonderful. So, yes, not a straight comparison, but still something to strive for. Turkey Hill beat them to the punch with their Double Dunker. It's got sandwich cookies and chunks of cookie dough with coffee ice cream.